God willing, the content of this blog will be migrated to its new site, starting sometime after midnight (here in East Coast America). I have been asked to make no changes during that period (it could be as much as 24 hours). Accordingly, I am turning off comments for that time. They’ll be turned back on when it transfer is done – and we’ll be operating from the new site. Some tweaking will continue for a time. I thank you for your prayers and support and the generous help from so many. Protestant teaching early on isolated the text in 1 Peter 2 that describes believers as a “royal priesthood,” and interpreted it in a polemical manner that negated the special character of the ordained priesthood. Many Christians today have no sense of priesthood, whether it be the priesthood of Christ or of themselves. “Priest” has ceased to have much modern meaning. 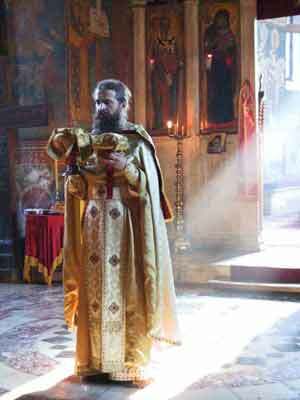 Orthodoxy holds that Christ is the one, true priest. The priesthood exercised within the Church is a participation in Christ’s priesthood. But what do we mean by priesthood in the first place? 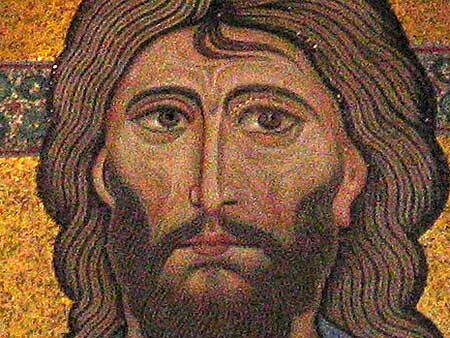 How is Christ our priest? For every high priest taken from among men is appointed for men in things pertaining to God, that he may offer both gifts and sacrifices for sins (Heb. 5:1). The most essential act of priesthood is offering. The priest presents our offerings to God on our behalf. He gives us the blessing of God on God’s behalf. Christ’s self-offering both to the Father and to humanity is the very definition of priesthood. The focus on Christ’s sacrifice as “payment,” as well as other images, have tended to weaken the sense of offering inherent in His death. Offering, for a variety of historical reasons, has been deeply diminished from the religious consciousness of many. The inner dynamic of the Eucharist is an offering. To live the sacramental life is to live a eucharistic life, a life of offering. For most, the word “offering” immediately invokes the image of “money.” This is not incorrect, even if it is limited. Money can certainly be an “offering,” but our thoughts on the subject probably miss the point. Money indeed has a sacramental character (as does all of creation). In a modern culture, money is something of a sacrament of all of our activity. As Christ Himself noted, it remains the primary means by which we may know the heart (Matt 6:21). Interest in spiritual things by those who do not practice “tithing” (returning to God a tenth of what we receive) can easily become an exercise in vanity. The failure to give alms generously (as in the tithe) can reduce spiritual activity to the level of a hobby. In this matter, the Orthodox differ in no wise from the non-Orthodox. Our culture is deeply enslaved by Mammon. Moderns are deeply suspicious of all things having to do with money. We see greed everywhere around us (except within ourselves). Non-believers think of Churches as rich and despise them. The myth of Church wealth is largely just that – myth. 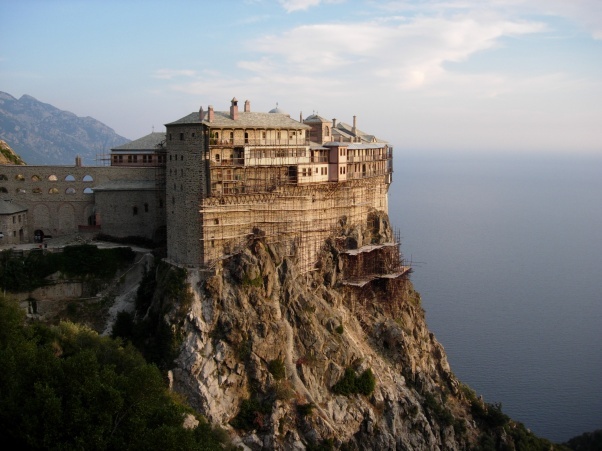 (The place of ancient land-holdings and State support of the Church, in lands such as Greece, is a separate topic). Generosity is more fundamental than fasting (people seem to pay great attention to the latter and little to no attention to the former). I have occasionally been told that modern welfare states have made tithing a thing of the past because our taxes now support the poor, etc. Taxes, no matter how well spent, are never a matter of offering, they are not eucharistic in nature. They are the object of coercion: no one voluntarily pays more than they forced to. What Caesar does with what belongs to Caesar is of no spiritual consequence to us. It is what is offered to God that constitutes a priestly existence. Therefore, I entreat Thee Who alone art good and ready to listen: Look down on me, a sinner, Thine unprofitable servant; and cleanse my soul and heart from an evil conscience; and by the power of the Holy Spirit enable me, who am endowed with the grace of the priesthood, to stand before this, Thy holy table, and perform the sacred mystery of Thy holy and pure Body and precious Blood. For I draw near to Thee, and bowing my neck I implore Thee: Turn not Thy face away from me, nor cast me out from among Thy children; but make me, Thy sinful and unworthy servant, worthy to offer gifts to Thee. For Thou art the Offerer and the Offered, the Receiver and the Received, O Christ our God, and unto Thee do we send up glory, together with Thy Father, Who is from everlasting, and Thine all-holy, good, and life-creating Spirit, now and ever and unto ages of ages. Amen. …”The Offerer and the Offered, the Receiver and the Received…” This is the very depths of the Eucharist. Read through the Eucharistic liturgy and note the use of the word “offer” and its various iterations. It is an exercise in truly hearing what is being said. To live the sacramental life is to live the life of offering. We offer has been offered to the Receiver and the Received. To behold the Received (and the Offered) in every element and moment of creation is to see the world in its truth. This is not an exercise in the imagination or a mere interpretation of the world. The fathers teach that the pure in heart actually perceive the “Logos-ness” of creation. The relationship between Logos and His creation is true, real and substantial, not merely referential. Modern Christians are profoundly non-sacramental. The simple statement, “We use things,” says it all. The world around us consists of things and is not perceived in its Christic relation. That this is so is only a comment on the frailty of our sinful state. That we are willing to think that this frailty is an actual description of the truth of things, however, is a comment on our perversity. Secularism is the life of the anti-sacrament. 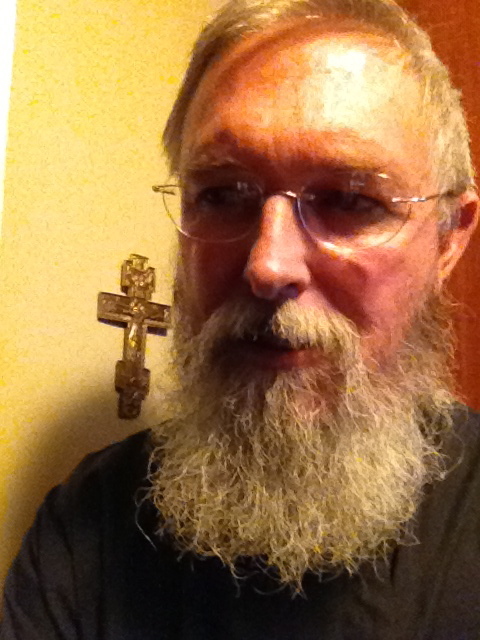 Priesthood ceases to be a life of Offerer and Offered, Receiver and Received. In the secularized world the priest becomes something of a civil servant, a functionary. Priests are hired and fired, compared and judged. They are measured by worldly standards of effectiveness or the simple whims of parish politics. If this is the case of the ordained priesthood, then it is worse still for the priesthood of all believers. Rather than bearing the dignity of the Microcosm, the anti-sacrament modern man reduces himself to Thing and User. Users and Things cannot inherit the Kingdom of God. O Lord God almighty, Who alone art holy, Who accepts the sacrifice of praise from those who call upon Thee with their whole heart, accept also the prayer of us sinners, and bear it to Thy holy altar, enabling us to offer unto Thee gifts and spiritual sacrifices for our sins and for the errors of the people. Make us worthy to find grace in Thy sight, that our sacrifice may be acceptable unto Thee, and that the good spirit of Thy grace may dwell upon us and upon these Gifts here offered, and upon all Thy people. Through the compassion of Thine only-begotten Son, with Whom Thou art blessed, together with Thine all-holy, good, and life-creating Spirit, now and ever, and unto ages of ages. Amen. 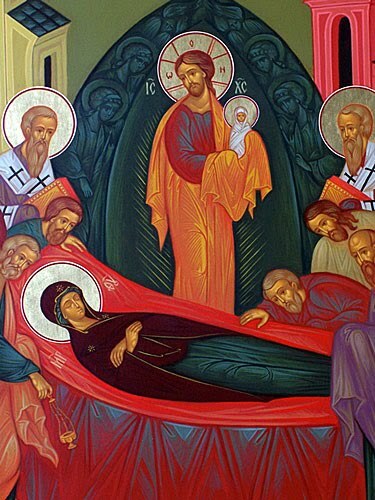 Orthodox Christians (New Calendar) commemorate the death (Dormition) of the Virgin Mary today. For those for whom such feasts are foreign, it is easy to misunderstand what the Orthodox are about – and to assume that this is simply a feast to Mary because we like that sort of thing. Flippant attitudes fail to perceive the depths of the mystery of our salvation. The Dormition of the Mother of God is one of many doorways into that mystery – all of which is Christ – who alone is our salvation. The Christian life, as taught by the Scriptures and the fathers, is grounded in the mystery and reality of communion. We do not exist alone, nor do we exist merely as a collection. Our lives are a communion of lives. We share one another in ways that permeate the whole of our being. I am unique, and yet I am also the child of Jim and Nancy. Though I am unique, so much of who I am and what I am is their lives and the lives of generations of human beings and culture – not just genetic relatives – but all of humanity. Without such knowledge (whether conscious or unconscious), we do not love as we should and will not live as we should. Your life is my life; God help us. There are many theological accounts of Christ and His work of salvation that center almost solely upon the idea of Christ as a sacrifice on the Cross that pays the penalty of our sins (the doctrine of the Penal Substitutionary Atonement). This account tends to “stand on its own.” There is nothing inherent within Christ’s birth from a Virgin to such a view of the Atonement. Nor does the Virgin herself have any inherent connection to the saving acts of God as made known to us in the Scriptures. Thus those who profess her virginity in such cases only do so because it is recorded in the Scripture – but they do not do so because they understand its true role in our salvation. However, our salvation is not achieved by an objective payment (even if the image of payment may be found in the Scriptures). The unifying teaching of the Scriptures with regard to Christ is our salvation through union with Him, through true communion in His life. His Incarnation thus becomes a part of reality of God’s restoration of our communion with Him. He becomes a partaker of our life, that we might become partakers of His. This reality is made profoundly clear in that God not only comes to dwell among us, but comes to do so as a man, having taken flesh of the Virgin Mary. He becomes “flesh of her flesh and bone of her bone” (Ge. 2:23). And yet another image: “And a sword will pierce your own soul also” (Lk. 2:35). Mary is united to Christ in the flesh, and mystical in her soul as well. thee did the Prophets proclaim of old. Perhaps the greatest collection of such references can be found in the 6th century hymn called the Akathist to the Theotokos. This prefigurement and their abundant use in the fathers, all flow from the fundamental understanding of salvation as communion. Thus she, as the Mother of God, belongs with Christ. She belongs with Him as the Golden Vessel belonged with the Manna (she is the vessel who contained the Bread of Heaven); she belongs with Him as Aaron’s Rod belongs with the buds which sprang forth (that He should be born from her virginal womb is like the life which springs forth from Aarons lifeless rod); she is the Tablet as Christ is the words inscribed; she is the lampstand as Christ Himself is the Lamp, etc. As the Creed tells us, Christ died, in accordance with the Scriptures. This does not mean in “accordance with the Gospel writings”, but “in accordance with the Scriptures of the Old Testament” (we first see the phrase in 1 Corinthians 15:3). Through the eyes of the fathers and the Tradition of the Church we begin to see that in accordance with the Scriptures is more than the few references that can be found that refer to payment or sacrifice or that point to the Cross. The Gospel given to us includes a very wholistic understanding of salvation and its story – and unfolds that from beginning to end. Therefore we were buried with Him through baptism into death, that just as Christ was raised from the dead by the glory of the Father, even so we also should walk in newness of life. For if we have been united together in the likeness of His death, certainly we also shall be in the likeness of His resurrection, knowing this, that our old man was crucified with Him, that the body of sin might be done away with, that we should no longer be slaves of sin (Romans 6:4-6). These comments on death and resurrection in the context of Baptism, in which “we have been united together,” only make sense in an understanding of salvation as communion. from whom God was incarnate and became a child. and thy womb He made more spacious than the Heavens. O Full of Grace, glory to thee! Her Dormition is indeed a day the earth stood still – for the Mother of us all passes from death to life. Within the next few days, the revision of Glory to God for All Things will be appearing. There will be some details that will be worked out after it first goes on line – thus I ask for patience ahead of time. I also offer my deepest thanks to those who have made this possible. I have developed a new catalog system for articles – though I’ve yet to enter it with the material. That process might take as much as a week (there are about 1500 articles to re-catalog and accurately characterize). In the fairly short-term, I am working on a series of articles on the Sacrament of the Heart, in which I’ll look at the Orthodox understanding of sacrament and its connection with the teaching on the place of the heart. If “all the world is a sacrament,” as the Patriarch of Constantinople has written, then we must learn to live and perceive sacramentally to proper inhabit God’s creation. That can only happen in the place of the heart. I am vacationing with family for a few days – seeing my two grandsons! – and hope to return to active duty after the weekend. Glory to God for all things, indeed! Last month I requested help from readers in supporting a revision of the Glory to God for All Things blogsite. The response was deeply encouraging (I’ve sent some notes of thanks). The work is beginning to mature and I hope to see something new up on the site in a couple of weeks. Thank you all for your prayers and encouragement. The community that exists around these writings and the conversations they engender is one of the deepest blessings in my life. I hope the new work will be a true improvement – making the site itself easier to use. I am finishing work on a catalog system that will make sorting through the nearly 1500 articles easier. It is staggering to see what the near 6 years of work has produced. May God grant it His continued blessing! Today is the patronal feast of my parish, St. Anne. St. Anne (Anna) was the wife of St. Joachim. Joachim and Anna were the parents of the Virgin Mary, according to the early tradition of the Church. In Orthodox commemorations they are referred to as the “ancestors of God.” It is a shocking title, perhaps even more shocking than Mary’s “Mother of God.” Christmas devotion has accustomed many Christians to think about Christ as a child and thus as a child with parents. But the popular imagination generally stops there. We forget the fullness of what it means to be human (perhaps because we ourselves live in a world in which our own humanity is severely truncated). St. Joachim was a priest who served in the temple. His wife, St. Anne, was unable to have children and elderly (a very familiar story in the pages of Scripture). The child Mary is a gift to them in their old age, a joyful intervention in their lives. The tradition goes on to tell how the couple present their young daughter for service in the temple (the Entrance of the Theotokos into the Temple). This feast, far more than a sentimental remembrance of a special day in the life of a young girl, is a feast of dynamic irony. The child who will become the true temple and ark of God when she conceives Christ, enters the temple which had been described as “Ichabod,” (“devoid of glory”). The temple that had once been filled with the glory of God stood empty. The ark had been carried away, the glory faded to memory. The child who enters appears insignificant, but is herself the fulfillment of the temple itself. She is the true Temple, the true Ark. The glory of God that will reside in her womb is none other than God Himself. 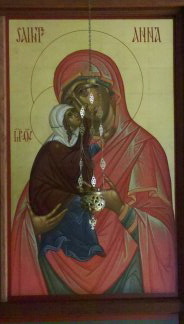 Orthodox devotion to the Mother of God and to the Ancestors of God, is a devotion born of Divine irony. The very phrase “God/Man” is the height of oxymoronic irony. How can a man be God? How can God be a man? It is the very heart of the Christian faith and a scandal to many. The same irony is the true revelation of God’s great love of man, and the foundation of human dignity. 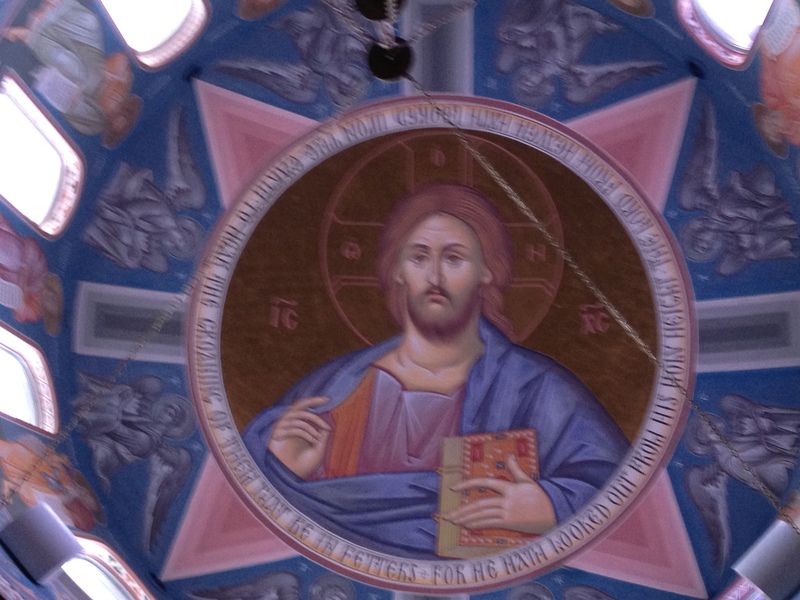 Only the incarnation of Christ protects humanity from destruction in the face of the Absolute. God, when considered as a cypher for the Absolute, will brook no rival, no diminution of His complete sovereignty. In the name of such an abstraction, human beings are all too easily swept away. We are less than dust and without value. No concept ever entertained by man is more dangerous than the concept of God. The Christian faith has no conception of God. God is not an idea. The Christian faith begins with a man, Jesus of Nazareth. It confesses this man to be both fully God and fully man and that through Him and through Him alone is knowledge of God possible. No man has seen God at any time. The Only-Begotten Son who is in the bosom of the Father, He has made Him known (John 1:18). Thus Christianity does not know a God who is revealed apart from man. It is the condescension of God, His meekness and humility that we see in Christ. We also see His great mercy towards mankind that He should raise us up and exalt us and bless us uniquely as sons and daughters. The dignity (worth) of human beings is guaranteed by this reality alone. Human rights, as the world now knows them, did not exist except through the foundational understanding of human persons made known in the revelation of Christ. The revelation of God in Christ not only makes it possible for us to know God but also makes it possible for us to approach in safety the throne of His glory. Ideas and abstractions offer no such thing. And so the Orthodox Church embraces the wonderful paradox and irony of God: that God should become a man; that a woman should be the Mother of God; that an older couple can be called the ‘ancestors of God’; that we should be fellow-heirs with Christ. Anything less is not Christianity. Anything less is simply a dangerous idea. Any parent who has raised a child has witnessed the miracle of human language. Even children with handicaps find ways to communicate except in the most extreme circumstance. The genius of language is not something we learn – it is instinctual for human beings. Those who study linguistics and neurobiology recognize that we have an instinct for grammar – not the polite rules of a high school English class – but the deep structures that make language work – any language. Children born into situations of “proto-languages” such as the accidental “pidgin” of occasional ethnic mixes – take that most rudimentary speech and generate a “creole” (a new language born of such pidgins) within a single generation. They are not taught this language – they invent it, complete with a grammatical structure they are not taught by a previous generation. The Scriptures tell the story of humanity with a profound sense of language. The first action of God is speech: “Let there be light!” God does not teach man to speak – we can only assume from the Biblical story that humanity and speech exist together from the beginning. God brings the animals to Adam, “to see what he would name them.” Animals could not exist within the human world and not be named. This is not because there is something inherently “nameable” about animals – rather it is human beings who must name. I say that we must name, because it is an instinct: theologically, it belongs to our nature. We do not think and then speak: thought and language are common. It is our behavior with words that perhaps best illustrates what it means to say that we are logikos. Even an abridged Greek-English dictionary will give a seemingly endless list of English words with which one might translate logos, the root of logikos. Most commonly, St. John’s prologue is rendered, “In the beginning was the Word [Logos].” The root meaning of logos is certainly “word” (lego “to speak”). But it is within the larger context of human beings as speakers, the instinctive grammarians of the universe, that logos finds its greater meaning. Some within the tradition have said that human beings exist in the image of God, inasmuch as we are “rational” (“rational” being yet another way to translate logikos). The result is the imagining of human beings as calculators. It is more accurate to speak of rationality as the perception that things have a grammar, a discernible structure that is susceptible to description and understanding. And so, we are rightly described as logikos. It is not simply that we offer words to God, for words are only one manifestation of our logicity. We have been told (!) that we are created in God’s image. He who created heaven and earth is imaged in those who reach for the very structure of that same universe. He offers the word, “Let there be,” and we respond, returning the praise (logikos latreia) with what that Word has made. We cannot imagine human existence without our logikos way of being. We are not logical (this word is a caricature of the Greek). But we cannot resist the urge to explain, to understand, to connect and see beyond and behind those things that appear. Even when our explanations are wrong we cannot accept no explanation. As noted above, there are limits to speech. The Church’s understanding of God asserts above all else that God transcends our ability to know or speak. At its heart, true theology is apophatic (without speech). But the Church does not teach that God is aphatic (against speech). That which is made known to us in the Incarnation of Christ is God the Logos. Even when we cannot speak God, we can know Him. And the God whom we know sounds an echo within our very being. And so the Church hymns believers as God’s “rational sheep” (logiki provati). It is a title of honor. The sheep return the honor by recognizing the Logos in all He has made (“all things were made by Him and without Him not anything was made”). We hear the song of creation and the voice of its groaning. We hear rocks sing and the harmonies of sub-atomic particles. And in the sound and grammar of all these things we hear the Word of God and sing to Him, his rational sheep. Everything is beautiful in a person when he turns toward God, and everything is ugly when it is turned away from God. In thinking about darkness and light – and their role in our apprehension of the truth – I cannot but think about Beauty, which is a primary place in which the light of God is made manifest among us (if rightly perceived). The heart that is full of darkness cannot truly perceive beauty: the heart which is full of light, cannot help but perceive it. Perhaps a measure of our heart can be found in how we perceive the world around us: is it primarily a place of beauty or darkness? It is difficult in the fallen world to maintain a witness to beauty. And yet those places where it is made manifest to us are so poignant, so piercing, that I think we cannot and should not remain silent about them. Perhaps they should be shouted from the rooftops! This article is a meditation on beauty and its role in our lives within the Kingdom of God. 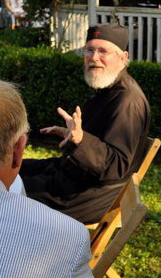 The quote from Pavel Florensky contains a world of truth, indeed, from a certain perspective it contains the whole of the Gospel. It is both commentary on how we see the world (as beautiful or ugly) or how we are within ourselves. The ugliness of sin is one of its most important components – and the inability to distinguish between the truly beautiful and the false beauty of so much of contemporary life offers a profound diagnosis of our lives and culture. To say that God is beautiful carries insights into what we mean by knowledge of God. “How do we know God?” is one question. But if we ask the question, “How do we recognize Beauty?” then we have also shifted the ground from questions of intellect or pure rationality and onto grounds of aethetics and relationship (communion). The recognition of beauty is a universal experience (as is the misperception of beauty). But the capacity to recognize beauty points as well to a capacity within us to know God (if Florensky is right). I would offer that this capacity is itself a gift of grace – particularly when we admit that the recognition of beauty is subject to delusion. Dostoevsky’s paradox, that “beauty,” for the mass of mankind, is found in Sodom, is a paradox that can hold two meanings. Either it can mean that even the corrupted “beauty” of Sodom can be redeemed (this is not Dostoevsky’s own intention) or that our heart can be so corrupted that we perceive the things of Sodom to be beautiful (closer to Dostoevsky’s point). We can also bring in a third – that of Florensky quoted above – that the “beauty” found in Sodom is corrupted precisely because it is turned away from God. It’s repentance can also be its restoration of true beauty. I prefer this third thought (which is more or less the same as the first) in that it carries within it the reminder that when God created the world He said, “It is good or beautiful” – both the Hebrew and the Greek of Genesis carry this double meaning. We were created to perceive the Beautiful, even to pursue it. This is also to say that we were created to know God and to have the capacity, by grace, to know Him. Consider the evangelical imperative: “Go and make disciples.” What would it mean in our proclamation of the gospel were we to have within it an understanding that we are calling people to Beauty? 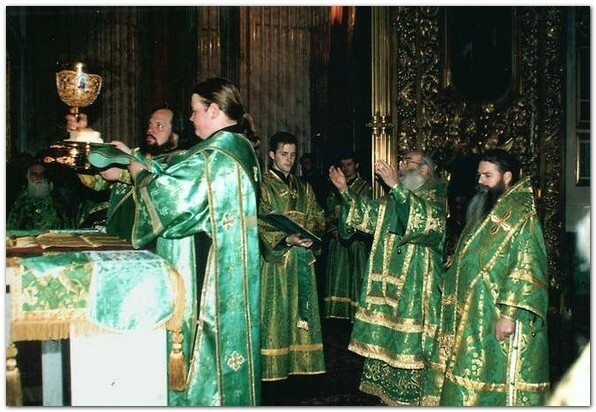 The report of St. Vladimir’s emissaries to Constantinople that when they attended worship among the Orthodox they “did not know whether we were on earth or in heaven. We only know that of a truth, God is with them,” is history’s most profound confirmation of this proclamation. St. Paul confirms the same when he describes the progressive work of our salvation as “the knowledge of God in the face of Jesus Christ.” If we would have our hearts cured of the illness that mistakes Sodom for the Kingdom of God, then we should turn our eyes to the face of Christ. There the heart’s battle will find its Champion and beauty will find its Prototype. In his novel, The Great Divorce, C.S. Lewis imagines a bus-load of people who travel from “hell” to “heaven.” Their trip takes them from a place described as “gray,” and ghost-like in its not-so-solid existence. Heaven, on the other hand, is quite solid. The day-trippers find the most immediate difficulty of their journey to be the problems of dealing with a solid world while being ghost-like. The grass does not bend (thus becoming something like small spikes). A falling apple is a most dangerous prospect. Lewis’ fictional imagery reveals a genuine metaphysical problem. Our popular imagination tends to equate “spiritual” things with the less-real and imaginary. Lewis properly reverses the equation and suggests that the spiritual is more “real,” more “solid.” Though the language of “solid” is perhaps too specific, it is an apt metaphor for how things are. When we speak of God and of those things that transcend our world, the Christian should understand that we are speaking about things whose existence is greater than our own. “Yet once more I shake not only the earth, but also heaven.” Now this, “Yet once more,” indicates the removal of those things that are being shaken, as of things that are made, that the things which cannot be shaken may remain. Therefore, since we are receiving a kingdom which cannot be shaken, let us have grace, by which we may serve God acceptably with reverence and godly fear. For our God is a consuming fire (Heb. 12:26-29). We dwell among “things that are being shaken,” but are receiving “a kingdom which cannot be shaken.” St. Paul does with shaking what Lewis does with solid. It is the less solid, the less stable, which can be shaken. Or, as St. Paul says, “the things that are made.” It is the things that are merely “created” that can be shaken. Only the uncreated remains. It is beyond understanding, but the promise of the fathers (and here in the Scriptures) is that in Christ we are to become “uncreated by grace.” God alone is “uncreated.” But by His grace, we become partakers of His uncreated life (which alone is unshakeable). This establishes the path of theology. We speak from the place of the shakeable about a place being revealed that is unshakeable. We speak from the less real, about the more real. What we know and experience is not unreal, but its reality is contingent and relative. Surely [the good man] shall not be moved for ever: the righteous shall be in everlasting remembrance. He shall not be afraid of evil tidings: his heart is fixed, trusting in the LORD. His heart is established, he shall not be afraid…(Ps. 112:6-8). The Scriptures grant an unmovable quality to the true self (heart). It is a spiritual creation, established in the Lord’s Pascha, and participates in the uncreated life of God. It is through that participation that we know Christ. True faith is not an ephemeral thought that passes through the ego. It is established in the heart and there it abides (I Cor. 13:13). Neither pray I for these alone, but for them also which shall believe on me through their word; That they all may be one; as thou, Father, art in me, and I in thee, that they also may be one in us: that the world may believe that thou hast sent me. And the glory which thou gavest me I have given them; that they may be one, even as we are one: I in them, and thou in me, that they may be made perfect in one; and that the world may know that thou hast sent me, and hast loved them, as thou hast loved me (Jn. 17:20-23). The Uncreated became flesh and dwelt among us – and now invites us into His uncreated life, that we might share in His glory, that we might abide in Him as He abides in us. This is true unity – not the political or social unity of negotiating egos. This is the unity of persons participating in a common life, whose prototype is the holy Trinity. The movement away from the instability of the false self with its anxieties, imaginings, ever-changing narratives, etc., is the most fundamental act of the spiritual life. Though the life of the heart is still largely hidden, it is the treasure hidden in the field. It is in the stillness (hesychia) and quiet of the heart that we begin to perceive Christ. That perception is of the truly real, the immoveable and uncreated life that is ours in Christ. It is not yet the uncreated light of which the fathers speak, but its life belongs to that light. I think evil is always small, and that good is infinite. Evil closes itself to God and thus becomes even smaller; Good opens itself to God and thus becomes infinite. Evil cannot become so large as to fill even the universe. God became so small that He could fill Hell and then burst it asunder because it could not contain Him. Every good deed will have eternal remembrance, but even the largest deeds of the evil will be forgotten. The Orthodox “experience” if I can use such a phrase, is the confirmation in the heart of the truth we have received as we grow in grace and in purity of heart. But the truth of the faith must be confirmed in such a living manner or it simply becomes an historical item and the Church would be a collection of antiquarians and not the living temple of God. For my knowledge of God is also my life in God. Life, light, truth, knowledge - all of these have something of a synomymous character. Without Beauty the world would cease to exist. We have to renounce iconoclasm. In so doing, we inherently set ourselves against certain forces within modernity. The truth is eschatological, that is, it lies in the future, but we also believe that this eschatological reality was incarnate in Christ, the Beginning and the End, the Alpha and the Omega. We do not oppose the future in embracing the Tradition we have received. We embrace the future that is coming in Truth, rather than the false utopias of modern man’s imagination. To know what we are, it is necessary to know what we shall be. Christ is, for us, both the icon of the Truth and the Truth of which He is the icon. To answer the question of what we shall be, the truth will only be found in Christ - who is both the revelation of God - but also the revelation of what it is to be human. Fully God and fully man, He is our definition. Indeed, He is the Truth of all things.